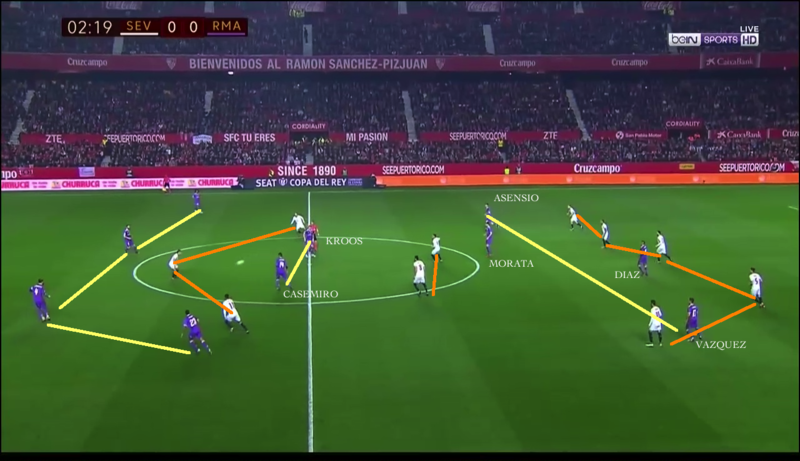 Eric Devin writes a detailed tactical analysis about the Copa Del Rey second leg match that ended Sevilla 3-3 Real Madrid. Real Madrid had turned in one of their most comprehensive performances of the season in thumping Sevilla 3-0 last mid-week in the reverse fixture of this Copa del Rey Round of 16 match. The two were set to meet again on Sunday in the league, and with Sevilla able to pull within three points of Los Blancos, manager Jorge Sampaoli opted for a decidedly rotated squad, leaving out the likes of Franco Vazquez, Steven N’Zonzi, Nico Pareja and Mariano. Zinedine Zidane did likewise, with Luka Modric and Cristiano Ronaldo not making the squad and Karim Benzema being restricted to a twenty minute cameo. That said, the match was far from devoid of interest, as Sevilla’s new arrival Clement Lenglet was thrust in at the deep end in central defense, and Mariano Diaz was given a rare start ahead of Alvaro Morata and Benzema at center forward, with Sergio Asensio played in a deeper role in central midfield. Or, at least that’s what the team sheets said. The reality for both sides, at least in the first half, resembled two boxers in the early stages of a match. Both Zidane and Sampaoli were constantly making slight tweaks to their systems, searching for the right balance. As a result, the first half wasn’t exactly pretty football, as both teams sought to play on the counter, but were stymied by a wariness on the part of their opponent. In the second half, things were slightly more ordered, with both sides’ systems more apparent and closer to their habitual playing style, but a general lack of focus from both sides saw the match drift badly, a poor penalty from Kranevitter and a moment of individual brilliance from Benzema allowing Real Madrid to extend their unbeaten run. Let’s start with Real Madrid, then, as their multitude of first-half changes was slightly easier to parse. My analysis of the first leg should have firmly dispelled the notion that Real Madrid only play a 4-3-3, especially without the vaunted BBC. Their formation in that match often resembled a 4-4-1-1, with Toni Kroos working off of Alvaro Morata. Here, though, Morata was on the pitch with another orthodox striker, Diaz. 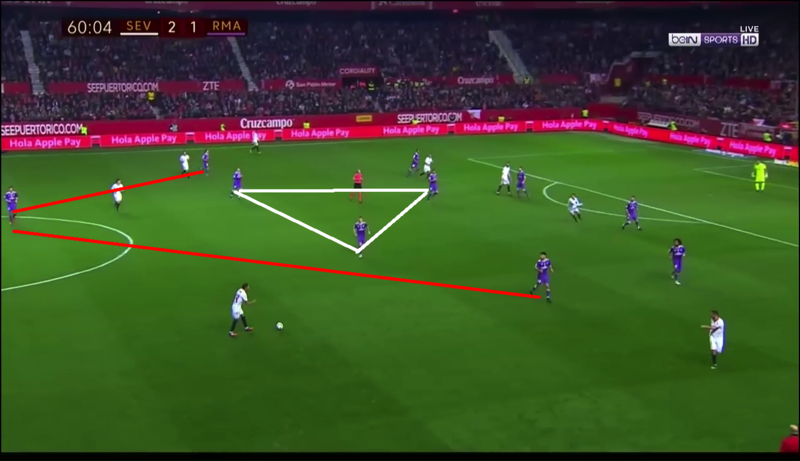 Thus, instead of Asensio playing as a right-sided central midfield, he played wide on the left, cutting inside when Marcelo got forward. The two strikers played close to each other, with Morata often dropping deep to help the midfield, so Kroos and Casemiro wouldn’t be overrun. Vazquez, then, played as a more orthodox winger on the right, although, to no one’s surprise, given his work rate, he could often be found tucking inside. The above image shows that gambit in practice, the yellow lines showing Real playing very narrowly. This allows all of the front four save Diaz to track back more easily; even though the system would seem somewhat suicidal given how Sevilla like to get numbers forward, a more cautious approach from Real’s fullbacks, Marcelo and Danilo allowed the visitors to maintain their numerical superiority even when Sevilla did attack with gusto. Thus, while the back four stayed fairly narrow, protected by a de facto double pivot of Kroos and Morata, the front could theoretically stretch play, much as the front three had in the first leg. However, indiscipline on the part of a inexperienced front four often saw them playing very narrowly, even in possession. Thus, rather than dragging Lenglet and Mercado out of position, Real were sterile in possession, the odd foray forward by Marcelo or Danilo really their only chance to stretch play. It should be mentioned here that Lenglet was excellent, showing great mobility to neutralize the threat of Danilo and Vazquez, but still, Real were entirely too static, and it is little wonder Soria hardly saw the ball. Sevilla, though, were much more the chameleon, even if they offered only slightly more menace than the visitors. Referring to the same image, we see also Sevilla’s opening gambit, a 5-2-3, indicated by the orange lines. One of the hallmarks of Samapoli’s tactics has been the use of players in a free role in attack, normally one or both of Vitolo or Samir Nasri. Without either on the pitch, though, it was much more difficult to create the team’s characteristic overloads, and what we see here is roughly how the team attempted to operate from the off. 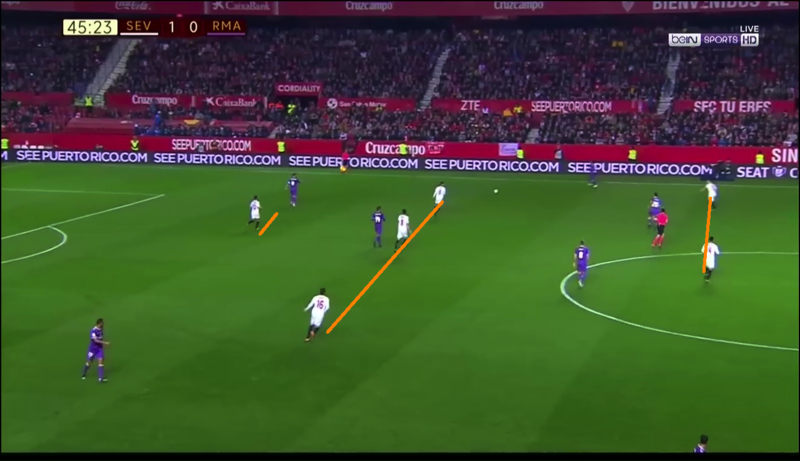 Escudero and Sarabia, shown here flanking the back three, would make runs from deep, offering an outlet for a switch of play or running with the ball to play in a cross. This image shows the system on the break, in greater detail as Escudero seeks to switch play. Here, the fullbacks push on, with Kranevitter dropping deep to help protect the back four, thoeretically freeing Iborra to get forward, as he is wont to do. Ben Yedder is now then the focal point in attack, with Correa and Vietto dropping back as intermediaries to help release the Frenchman. The issue is apparent here, though. Even on the break, without the energy of Casemiro and Kroos, Sevilla made it too easy to limit the effectiveness of Correa and Vietto, as without Sarabia to stretch play on the opposite flank, there is no space and Real’s center backs can cope with the attacking trio, even if Marcelo were caught out, as he is here. 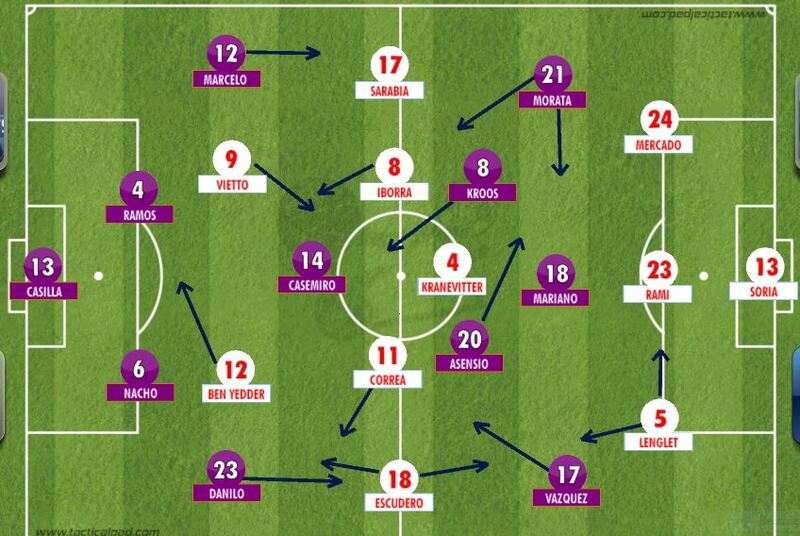 However, when Sevilla did get the balance right, they were more potent, as this image shows. Iborra, with his height and physicality, has got forward to be a target man alongside Ben Yedder, while Escudero and Sarabia are very high. The two wingbacks hug the touchline, a threat to turn and go after a ball over the top, but Kranevitter’s limited range of passing unfortunately makes this a less effective option as well. Steven N’Zonzi has earned plaudits this season for his energy in controlling the midfield, but his long passing has also been integral to Sevilla’s success, and lacking that, the threat of the two wide players was less effective, even as Real Madrid stay very narrow and compact, vacating the zones indicated by the yellow boxes. Recognizing this, Sevilla tried to adapt, but Real sat back, their 4-2-4 becoming a deep-lying 4-4-2, indicated by the yellow lines. Thus, as Vietto (receiving the ball from Kranevitter) seeks to link play through a more patient, possession-based approach, the visitors, without fearing the width provided by Sarabia and Escudero, are able to sit back and limit service to what has become a front three of Correa, Iborra and Ben Yedder. 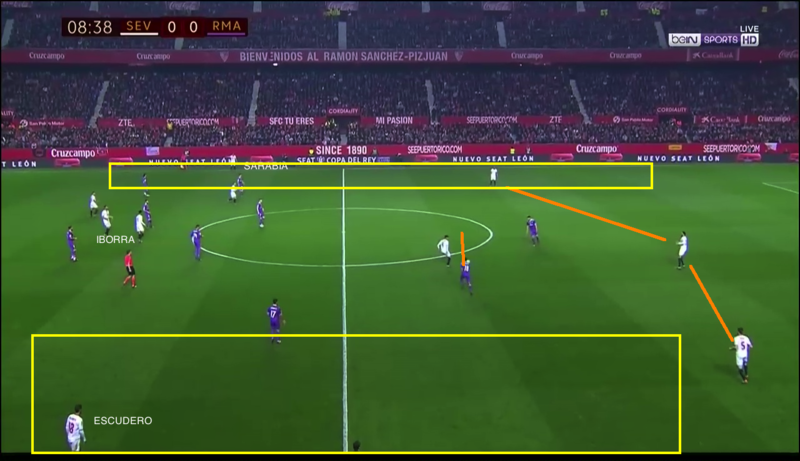 In this situation, even as Vazquez moves toward Vietto, Real scarcely even needed their characteristic press, trusting the aerial prowess of Ramos and Nacho against potential crosses. Injury to Correa forced the introduction of Stevan Jovetic, and the above image shows how the former Inter man was used wide on the left, with Iborra playing off of Ben Yedder, and Vietto on the opposite side. Again, though, there was no width, and even though Jovetic is a decent header of the ball, he was wasted here in the 4-2-3-1 indicated by the orange lines. Fortunately for the hosts, Sampaoli thought better of this, having likely only wanting to see out the half. The second image shows Sevilla’s changed focus, having gone to a 3-1-4-2 with Jovetic playing closer to Ben Yedder as Iborra plays a shuttling role alongside Vietto centrally. Escudero and Sarabia have moved forward and are once again very wide. In this way, Sevilla’s wide men had more to aim at centrally, and Jovetic duly scored from a cross to give the hosts the lead after Real had equalized. Real were frustratingly slow to adapt, though, as the first image shows. Even though Sevilla have already scored from a cross, here is Sarabia once again receiving the ball in a wide area with plenty of space ahead of him, as indicated by the yellow line. Marcelo and Asensio move toward the right winger, but it is too easy for the former Getafe man to turn past them; one opportunistic touch will have him in the clear. Zidane, seeing the inability of the personnel to change their shape with any confidence, swapped Diaz for Kovacic, and in the second image we see Real in their customary 4-3-3. The white triangle shows the midfield, with Casemiro deepest and Kroos and the substitute further forward, while the red lines show the relationship of the forwards, as Asensio remains an outlet on the counter, Vazquez and Asensio drop to cut off the passing lanes. Even with so many men forward, there are no clear options for Mercado, who has come forward with the ball under no great pressure. Frustrating though this match could be, it did serve to underscore the relative depth of both teams as it relates to their abilities to succeed tactically. Sevilla, in particular, were unable to effectively present their habitual variety of approaches, limited by the absence of the unpredictability of Vitolo and Nasri. Real, by contrast, were undone, at least in the first hour, by a static style, with both Kroos and Casemiro slightly unclear as to when to go forward for fear of leaving the center of the pitch exposed. Vazquez and Asensio were similarly hesitant, perhaps uncharacteristically preoccupied by the midfield’s own irresolution. As both managers seek to balance European and domestic competition in the weeks and months to come, they now have a much clearer idea of what will and won’t work against top-class opposition, the somewhat vexing encounter thus valuable for more clearly defining each side’s limits.